This recipe for Beef Stew for two is made velvety by the addition of plain gelatin. Pearl onions and mushrooms elevate the flavors above every day stews. If you don’t believe that bacon makes everything better, brown the beef in 4 teaspoons of vegetable oil. 1. In a small bowl, combine the kosher salt, black pepper, and granulated garlic. 2. Trim the beef of excess fat and cut into 1 inch cubes. Season evenly with the salt mixture, tossing to coat. Set aside. 3. Preheat the oven to 325°. 4. In a large oven safe sauce pan, cook the bacon, cut into a small dice, until browned and crisp. With a slotted spoon, remove the bacon to a paper towel lined plate, leaving the drippings in the pan. 5. Working in two batches, brown the beef cubes in the bacon fat. Remove to a bowl. 6. Add the diced onion and carrot to the fat in the pan and cook over medium heat until softened. 7. Stir in the garlic, tomato paste, anchovy paste, and thyme. Cook until fragrant, about 30 seconds, then stir in the flour and cook a minute longer. 8. Slowly stir in the wine, scraping up any browned bits from the bottom of the pot. Add 1 1/2 cups of the beef broth and bring to a simmer. 9. Return the beef to the pan, cover, and transfer to the oven. Cook for one hour, then check the meat for tenderness. 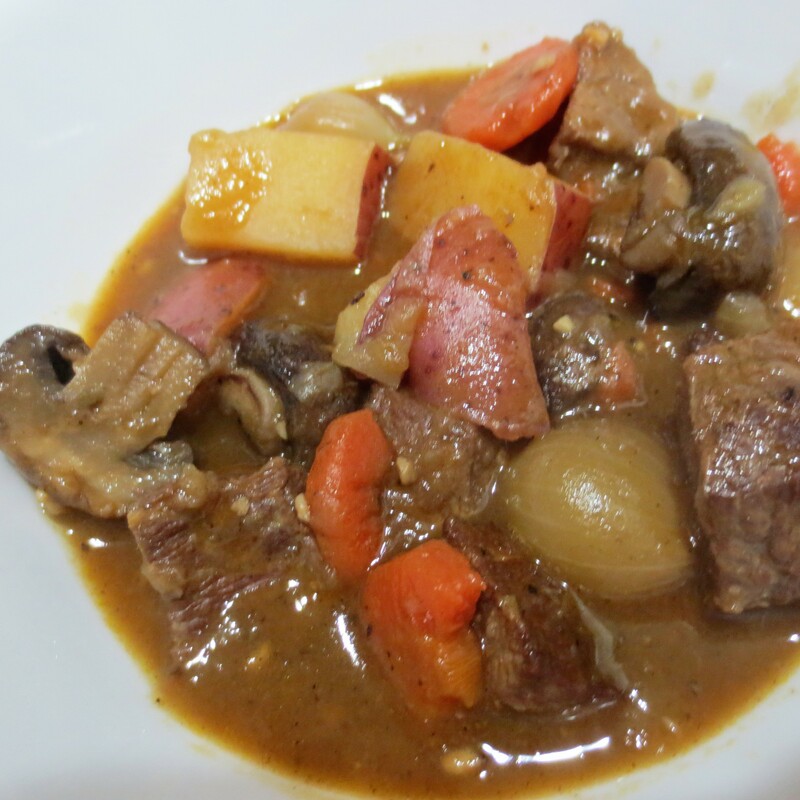 Depending on the cut of meat used, the stew may need another hour or more. 10. When the meat is nearly tender, heat the vegetable oil in a large skillet. Add the mushrooms and cook over medium high heat until browned. Add the pearl onions and cook until lightly browned. Set aside. 11. Sprinkle the gelatin over the remaining 1/2 cup of beef broth and let stand to soften, 5 to 10 minutes. 12. Remove the pan from the oven and stir in the softened gelatin mixture, potatoes, mushrooms, and pearl onions. 13. Cover, return to the oven, and cook until the meat and onions are tender, about 30 minutes longer. 14. Remove from the oven and add the reserved bacon, peas and soy sauce. Let stand 5 minutes before serving.